Rich stocks. Wholesome ingredients. Never frozen. 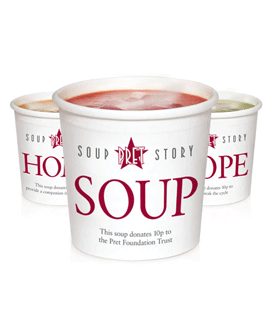 You probably could live on Pret soup alone, but we'll send a fresh baked roll along anyway. You know, just in case. Your local Pret offers a selection of the following soups. A hearty blend of broccoli and sharp aged cheddar, rich and full of flavor. A Mexican-style chicken soup blended with tomatillos, jalapenos and lime juice, then simmered with tender pieces of hominy and roasted corn. A bold soup packed with hearty lentils and chunky vegetables, with a handful of spices and a dash of balsamic vinegar to create an authentic Moroccan taste. Delicious chicken and vegetables are stirred into a rich, handcrafted chicken stock while edamame and egg noodles add body as well as bite. Enjoy a freshly baked bread roll with your soup.